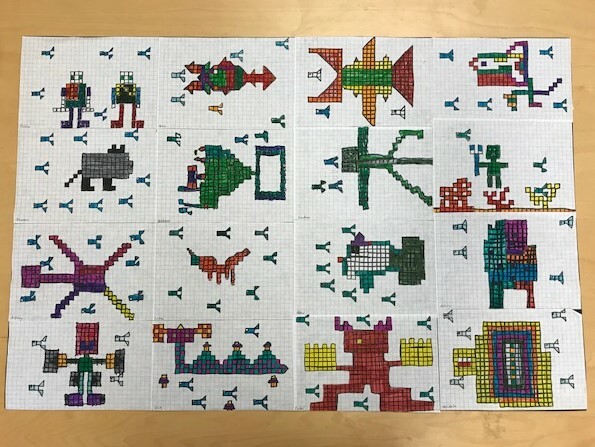 The 3rd graders did a study of Bitmap and Vector graphics. They learned about the differences and uses of the two types. They learned that bitmap graphics are used for photos. There are small squares called pixels that form the photo. The computer must record each pixel to create and store that image. This creates a very large file. I showed them that you can see the individual pixels when you zoom in on the photo. These types of files do not remain clear when they are enlarged. The other type of graphic we study was the vector. This type of graphic uses anchor points and paths to record a logo type file. Based on a math grid, anchor points are determined and then a line (path) is drawn between those points. The paths must create a closed object or it will not work. This requires a much smaller amount of information that needs to be stored in a file. This type of graphic is mainly used for logos. They can be enlarged to any size. Think about the advertisements that you see on a billboard or the side of a bus. To demonstrate these two types of files, we made two pieces of art. For the bitmap image, we made sea creatures using graph paper. Each individual pixel was colored to create the creature and still show the squares. In the background, we made fish and the color blue to represent the surrounding ocean. We used all the creatures to create a picture that made the creatures appear to be underwater. When we were up close, we could see the squares, but in the back of the room, it looked like an ocean scene. Since the sea creatures were not randomly placed, the “photo” did not give us a realistic bitmap effect, but they understood the concept. The vector graphic example consisted of tape placed on a poster board. The students took turns placing tape anywhere they wanted. After they were done, they colored only the shapes that were closed. When it was finished, it created a logo where those shapes were placed. All of the open paths were not colored. This is a great learning experience. It exposed them to the world of graphics. There were two types of software that we discussed for the different types. I told them about Photoshop and Adobe Illustrator. Even though these two are very powerful and useful, getting the most from them takes lots of study including reading books that others have written. They learned that there are professional graphic designers that do this for a living. They create logos for company advertising, websites, games, and movies, etc. There are also people that do photography and work with Photoshop to do editing for magazines, catalogs, movies, etc.